West Texas poses a special challenge to landowners seeking to plant trees on their property. The scarcity of water, the presence of caliche (hardpan), the danger of wildfire all serve as significant challenges to planting trees. Of note, it is important for the long term health of trees to break through caliche when planting trees in West Texas. This can be done by hand or with mechanical drills (a two man auger). Planting for prevention of wildfire will be discussed elsewhere. Of all the above issues, lack of water is clearly the biggest problem when establishing trees. Per the National Geographic Society, a desert is an area with less than 10 inches of rain per year. By this definition, much of west Texas is desert or near desert. Planting trees in desert is difficult due to the high initial water need for newly transplanted trees. In areas with high water costs or rural lots with no running water, this has prevented most trees from being planted in dry West Texas, until the invention of the Groasis Waterboxx. The Waterboxx is a self refilling water battery for trees and other plants. When a tree is initially planted with the Waterboxx, the soil is watered with 4-10 gallons, and the Waterboxx itself is filled with 4 gallons of water. The Waterboxx then is self refilling from dew and rain water, and does not need to be refilled as long as it is left in place. The Waterboxx can then be reused for up to ten trees. The Waterboxx is explained below. When deciding which trees to plant in West Texas and similar climates, you must decide what purpose you are trying to serve. Pines and other conifers make excellent windbreak trees primarily because they function year round. Several evergreen trees grow will grow well in West Texas. Of note, if you plan on grazing cattle on your land we would recommend against planting conifers due to the risk of pine needle abortion for pregnant cows. First, the Eldarica Pine (Pinus eldarica), which comes from central Asia initially. The Persian emperors, wanting to be known as gardeners, planted this tree in areas where nothing else would grow. In fact, they prevented common people from planting this, earning it the name "the tree of royalty." Luckily, in America, everyone can plant this tree. It is very tolerant of drought once established with the Waterboxx, and can tolerate many different soils. Its growth is rapid, but it is not invasive. The Aleppo Pine (Pinus halapensis) is similar but with a somewhat more slow growing pine from the Mediterranean basin. This pine is known for its frequently curved trunk. Despite its name, the Arizona Cypress (Cupressus arizonica) is a Texas native that also works well for year round windbreaks. This tree is also very rapid in growth and tolerates alkaline soils. It will prosper in zones 7-9, and can reach 50 feet in height. It has a beautiful blue white hue to its needles. Inexpensive saplings of this tree can be purchased from Arbor Day. 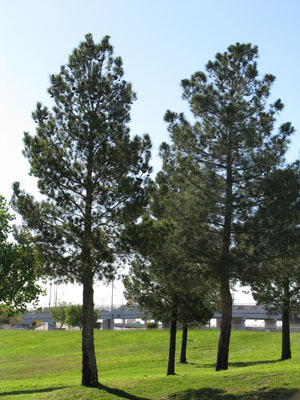 Another conifer suitable for planting in West Texas is the Italian Stone Pine, or Pinus pinea. This tree is less suitable for a windbreak because it tends to only grow a canopy at its topmost end. It makes up for this deficiency by producing edible pinenuts, which can be eaten by both humans and wildlife. The tree itself is quite stately, and can grow 80 feet tall and 25 feet in width. The Italian Stone Pine can be purchased online here. As we leave our discussion of conifers, we turn towards the deciduous trees that grow in West Texas. Most of these trees turn out to be oak, which are also fire wise trees. The Chinkapin Oak (Quercus muehlenbergii) is another stately oak that will grow in northern Central to West Texas if established with the Waterboxx. It grows faster than the Bur Oak, but has several of the same advantages. It also can be purchased inexpensively from Arbor Day. The Escarpment Live Oak (Quercus fusiformis) is also known as the Texas Live Oak. This tree is a marvel, growing from Oklahoma to Mexico. It requires much less water than it southeastern cousin Quercus virginiana. This tree is very long lived but also quite fast growing. 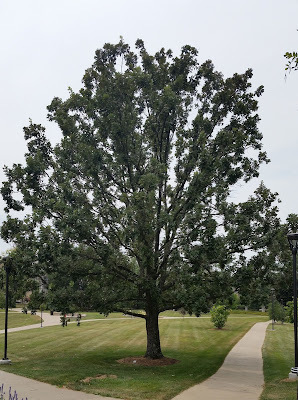 This tree has a massive canopy, and diseases can spread from one tree to another through root contact so sufficient spacing (80 feet minimum) is required. This is an excellent shade tree and would make an excellent focal point for most properties. This tree actually retains its leaves throughout the winter, making it a rare deciduous evergreen. 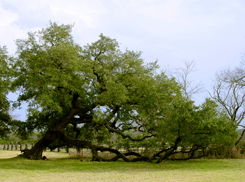 Buy the Texas Live Oak here. The above trees can provide windbreaks, erosion protection, wildlife habitat, or future lumber or firewood for use. Planting large numbers of trees on your property can also change the microclimate of the land, allowing grass to become established and the land to be used for grazing. Planting trees in the desert before the invention of Waterboxx was impractical due to the difficulty watering newly planted trees. However, today you can plant tree saplings in the spring with the Waterboxx, and return the next spring to remove and reuse the Waterboxx for another tree - with no work needed in between. The Groasis Waterboxx can be ordered from Dew Harvest in the continental United States. I need some answers with a tree that is trying to die in my yard. I live in Lubbock, TX. The tree has turned brown and leaves are dry. We have had rain recently and it recieves rain daily for ine hour. All other trees are healthy but some leaves are turning dry and brown at the edges, like burned.